Zuni Consolidated Schools is a fictional school district. 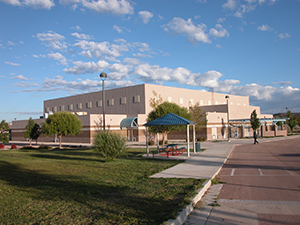 The real school district on the Zuni reservation is the Zuni Public Schools district and consists of two elementary schools, a middle school, and a high school. "Zuni High School Gym, Zuni, NM, September 26, 2006" by Lou86 is licensed under CC BY.